Baby Hazel is very much excited as her school has announced a picnic to water park. She has to pack her picnic kitty with the necessities required to get wet in water pool and slides. Help darling Hazel in packing her picnic bag. Join the kids to enjoy funfilled schoolbus drive and play games on their way to park. Get thrilled with Hazel and other kids with a ride on water slides. Have lots of fun with Hazel at water park! Yippee! Baby Hazel is thrilled with the school picnic announced in her class. School picnic is a water park so she has to pack her bag with required costumes and other essentials to enjoy water slides. Join mom and dad in packing the picnic kitty for Hazel. Baby Hazel and her classmates have a great fun and enjoy interesting games on their way to water park. 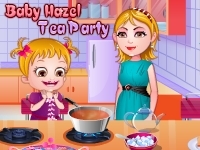 Join Hazel to indulge in funfilled activities and games. Attend all the needs of Hazel to earn bonus points. Its time to get wet in swimming pool! Baby Hazel and her friends are all set to swim in the pool. But before that make sure she has applied lotion on her body and serum on her hairs to avoid chlorine itching and rashes. Baby hazel is having great time at water park. She thrills with exciting water rides and enjoy rain dance with her friends. Be with Hazel and don' leave her unattended as its her first visit to the water park. Keep her happy by paying heed to all her needs.